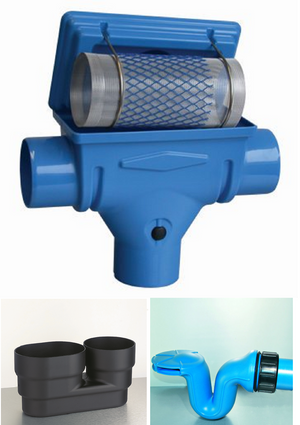 Commercial Rainwater Harvesting Filter - 1 stage - 110mm CF -150m2 – Freeflush Rainwater Harvesting Ltd.
Rainwater flows onto the filter cartridge. The filter cartridge cleans the rainwater. The cleaned rainwater flows through the calmed flow inlet into the rainwater tank. 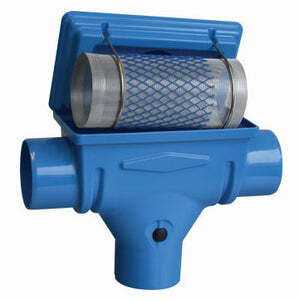 Because of the smooth surface structure of the filter the dirt is quickly rinsed away into the sewer. Due to the horizontal position of the filter cartridge, the filter gets dirty more rapidly as a filter cartridge with steep inclination. We therefore recommend using the 3P Back-washing Device and regular cleaning with detergent and brush in order to degrease the filter sieve. If you wish to use the cleaned water inside the home the back washing device is essential. Height difference between rainwater inlet and outlet 0 mm (zero). PF + SF consisting of: Back-washing Device and Connection Set. Retro-installation possible. consisting of: Back-washing Device, Connection Set and Programmable Timing Device. For filter removal in deeper installations.